The Japanese prime minster’s anticipated speech to a joint session of the U.S. Congress. 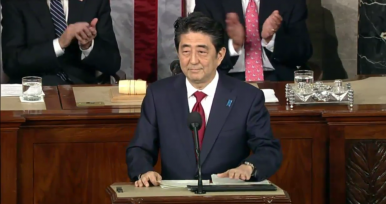 Japanese Prime Minister Shinzo Abe delivered his long-awaited speech (in English) to a joint session of the U.S. Congress today, becoming the first Japanese prime minister to do so. Abe’s speech took on epic proportions due to the timing – with his August 15 statement on the 70th anniversary of the end of World War II looming, analysts are looking to his congressional speech for clues on what the “Abe Statement” will look like. Meanwhile, Abe himself wanted to use his speech to highlight the importance of the U.S.-Japan alliance, both in the security realm and on trade issues. Abe would use his speech to make the case for the Trans-Pacific Partnership, which faces steep opposition in Congress (ironically, largely among President Barack Obama’s own Democratic Party). Below, I examine each of these elements in more detail. As expected, Abe focused most his remarks on the future (rather than the past) of the U.S.-Japan alliance. Abe spoke at some length about the common values the two countries share – “the rule of law, democracy, and freedom” — with anecdotes about his own personal embrace of democratic values during his time as a student in California. Abe celebrated the transition of the U.S.-Japan relationship from wartime adversaries to allies and partners. Japan, Abe said, “made the right decision” in the aftermath of the war by choosing “to ally itself with the U.S., and to go forward as a member of the Western world.” Abe claimed a joint victory with the United States and “like-minded democracies” in the Cold War. “No new concept should ever be necessary for the alliance that connects us, the biggest and the second biggest democratic powers in the free world, in working together,” Abe said. As for the future, Abe emphasized Japan’s support for the U.S. rebalance to Asia. He also pointed to Japan’s contributions to that strategy, though deeper partnerships with Australia, ASEAN, India, and South Korea. Abe also highlighted Japan’s past contributions to the Gulf War and peacekeeping operations around the world. Abe explained Japan’s own defense reforms, which are still making their way through the Japanese legislature. Abe told Congress that “we are determined to enact all necessary bills by this coming summer.” Those reforms, and Japan’s future approach, are part of Abe’s plan for making a “proactive contribution to peace based on the principle of international cooperation” – a phrase he emphasized by repeating twice. Rather than framing the alliance as one of containment, Abe framed it as a proactive force for “the rule of law, respect for human rights, and freedom.” Abe concluded his remarks by labeling the alliance the “alliance of hope.” “Let the two of us, America and Japan, join our hands together and do our best to make the world a better, a much better, place to live,” Abe said. Abe also made his pitch to Congress on the importance of the TPP. Rather than framing it as a race against China to make global trade rules for the 21st century (as Obama has taken to doing recently), Abe spoke more generally about trade practices that threaten U.S. and Japanese values. “In the Pacific market, we cannot overlook sweat shops or burdens on the environment. Nor can we simply allow free riders on intellectual property.” Advancing TPP, in Abe’s formulation, is a way the United States and Japan “can spread our shared values around the world.” For Abe, that is source of the “awesome” strategic value of the negotiations. That’s likely not enough to mollify critics, who have been active in bringing attention to historical issues. Rep. Mike Honda (D-CA), one of the most outspoken critics of Japan’s handling of the issue, invited Yong Soo Lee, a Korean “comfort woman,” to attend Abe’s speech as his guest. Honda wrote an op-ed for CNN earlier this week, telling Lee’s story and calling on Abe “to do right by these women, and issue an unequivocal and irrefutable apology” during his address to Congress. Lee herself also spoke to reporters on the Capitol lawn on Tuesday and was profiled in a Washington Post story published on April 22. Abe’s speech hit all the expected notes: praising the U.S.-Japan alliances, explaining the necessity of proposed defense reforms, arguing for TPP, and indicating remorse for historical issues (without the sort of direct language of apology that critics have demanded).